With winter here, many of us will be using our heaters to keep us warm. We know that heaters uses energy to run, but do you know how much your electric heater is costing you? There’s a study done by the sustainable by the Victoria sustainable energy authority released in 2002. The results of that study for the cost of electric heaters are shown below with the prices adjusted to the energy cost in NSW in 2010. Back then the average peak cost of electricity was 15 cents/kWh, in 2010 it is now 28 cents/kWh. All monthly costs assume heating is used for 8 hours per day in Melbourne. Running costs can vary considerably based on such factors as heater size and efficiency, thermostat setting, length of use and building efficiency. from these. Most older homes would have costs towards the higher end of the range. Lower figures would apply to fully insulated houses. All figures are given for homes of 150 m2 with 2.4 m ceilings. Calculations for larger or smaller homes can be estimated proportionately from these. Lower figures are for fully insulated houses. Energy smart homes can reduce these costs by up to 30%. Note: in-slab heating runs 24 hours per day. Wow, that really shows just how expensive any form of electrical heating is! The problem with using electricity for heat is that it’s not terribly efficient. We burn oil, gas or coal to produce heat to generate the electricity, and there are significant losses in this process. Then we have transmission losses getting the electricity from the power station to our homes. Turning it back into heat is actually fairly efficient, though. The whole process is a lot more efficient if you cut out the power generation and transmission, and simply burn gas right where you want the heat. The other thing I get from the above figures is that home insulation saves a lot more money than it costs! @Darren electrical heating is expensive. Wood fire heating would be the cheapest alternative, but gas heating is probably the most practical alternative for most households. You also brought up a good point with home insulation, it might look expensive with a high upfront cost, but it is cheaper in the long run. Wow! Didn’t realize that the difference is so much. I am gonna be dead with my electric heater cost! Gotta look into a gas heater option. 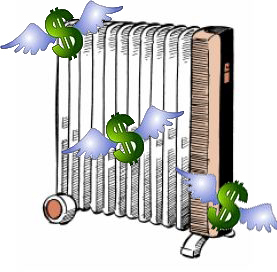 Finding good information from blogs is not always easy, but you have done a great job here, interesting title ( How much are your electric heaters costing you? | Little Handy Tips ) too, cool. But gas heaters are not safe for inside use, so sometimes the electric heaters are the only solution. My sons electricity bill is 5000.00 dollars in a small eleven square house they use two oil heaters. He payes 500 a month ,but electricity bill keeps going up , and they threaten to cut of power . to the continuing popularity of paraffin as a source of energy for domestic properties. latter, they can clog up your heating system, especially the fuel tank filter.